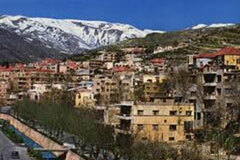 Zahlé is known as the "Bride of the Beqaa" and "the Neighbor of the Gorge" due to its geographical location and attractiveness, but also as "the City of Wine and Poetry" It is famous throughout Lebanon and the region for its pleasant climate, numerous riverside restaurants and quality arak. 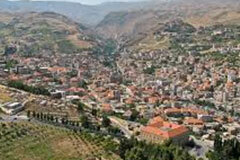 Zahlé was founded in the early 18th century, in an area whose past reaches back some five millennia. It enjoyed a brief period as the region’s first independent state in the 19th century, when it had its own flag and anthem. Due to its relative geographic isolation from the local centers of power in Mount Lebanon and Syria, the town did not have any significant allies in the region to fall back on in case of conflicts or attacks. This led its inhabitants to develop a defensive attitude, which can still be felt today. Situated across the street from Grand Hotel Kadri, Menshieh is Zahlé's oldest and shadiest park (newly opened J.T.Skaff Park is larger, but contains considerably fewer trees). The park houses a collection of marble tables with mosaic depictions of several sites in Lebanon, a small pond with waterlilies, a semi-circular marble tholos, and several sculptures representing famous locals. In 2003, the municipality covered a 25 m (82 ft) fir (the park's tallest) with thousands of lights, in an attempt to break the world record for the largest natural Christmas tree. 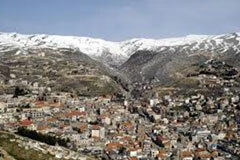 The banks of the Berdawni River have long been a place where people of Zahlé and other parts of Lebanon come to socialize. 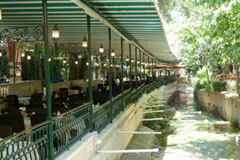 The town's most popular attraction is a 300 m (984 ft) promenade along the river, referred to as "Al Wadi" ("the valley"). Sheltered between the ravine's limestone cliffs, it is lined up with large outdoor restaurants, cafes and playrooms, and shaded by trees. These restaurants specialize in traditional Lebanese meze served with arak. The promenade is closed during late fall and winter, when cold winds from the mountain sweep through the ravine.